How do I change our contact number? Got a new phone number, or mobile? You can change that in Venuemob Manager. You can edit your phone number and name via Venuemob Manager. There are two ways to do this. You can edit this information only for accounts you have access to. First, log into Venuemob Manager. 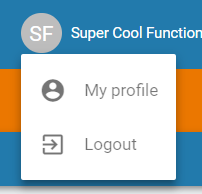 Then, you can either click on the top right hand corner icon with your initials (or the account holder name initials). Click on My Profile. Then, add your new phone number, and click Update My Details. Alternatively, you can navigate to Staff and click the pen icon next to your details. Remember to press save after you've made your changes!